Take a look at this submission from Frank, one of my readers. A great suggestion for [tag]drills to get quicker for basketball[/tag] that can work with all age groups. 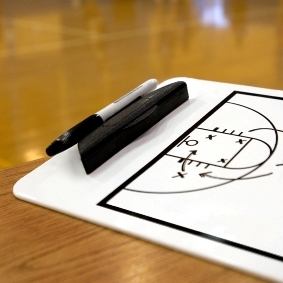 Here is one of my favorite [tag]basketball drills[/tag]. I have 1 player under the basket; the other 2 on each side of the basket. I shoot the ball (I try to miss but sometimes it goes in). I have them just play it. The player under the basket gets the rebound and outlets the [tag]basketball[/tag] to one of the wings. They run a 3 on 1 against my assistant [tag]basketball coach[/tag] on the other basket. Then they run it back against me on my side of the court. When they finish another 3 players run it. Each player stays in one lane. When they finish they can switch lanes. This [tag]basketball drill[/tag] gets them to run a fast break at game speed and gets them to make quick decisions at a quick pace. This also helps build endurance. I would also like to comment on the [tag]basketball shooting form[/tag] BEEF. My philosophy is another E known as Energy. When you shoot with balance and proper form your energy is going forward. When you shoot a fade away you have to adjust your shot so your body is going backward while your arms are going forward. We have an energy field around us that you can’t see but if you were with me I can show you how a six year old can take away the energy of an adult and weaken him for a few seconds.